The burbling and growling AMG family in India is about to get one more addition tomorrow in the form of the SLC43. The roadster will be the very first Mercedes-AMG model to be christened with the ‘43’ nomenclature and it is the successor to the SLK55 AMG. The biggest change is the new engine. In keeping with the era of downsizing, the new 3.0-litre twin-turbo V6 replaces the old, burly, naturally-aspirated V8. The new motor produces 367PS of power and a peak torque of 520Nm. 0-100kmph comes up in a claimed 4.7 seconds, with the top speed rated at 250kmph. The SLC43 comes with a 9-speed dual clutch automatic gearbox as standard and the transmission gets paddle shifters as well. You can also opt for a ‘handling package’, which gives you a mechanical limited-slip differential for the rear axle. The design isn’t a biblical breakaway from the SLK, but cosmetic updates include a new front bumper with revised air intakes, a new diamond-pin front grille, a different set of headlamps, 18-inch alloy wheels and a new rear bumper with integrated tailpipes that feature chrome highlights. As expected, the feature list is a gizmo-galore with blind spot assist, active brake assist, a 7-inch touchscreen infotainment system, Bluetooth connectivity and Garmin map pilot navigation included in the kitty. Born in 1996, the SLK-nameplate accrued 6.7 lakh sales through its lifetime. 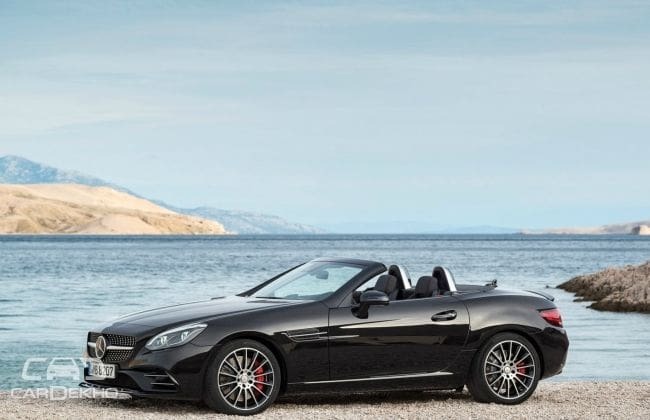 With the SLC43, Mercedes-Benz won’t be looking at big sales numbers in India, but it will look to give the likes of the Audi TT and BMW Z4 some competition.